Since I work double shifts when I work outside of my home, I usually get some sense of what dinner will consist of while making breakfast, early in the morning. That way if I need to thaw some chicken or something I have time to allow for it. If I need to get one more item from the store, I plan that too. I try to always keep potatoes, either sweet or a variety of white on hand, along with an assortment of rice and pasta and even an assortment of frozen vegetables. I prefer fresh produce but that’s not always possible. In the dish that I’ve illustrated, I seared off some boneless, skinless chicken breast in my largest ovenproof skillet and then set them aside. To the same pan I added cubed red potatoes (no need to peel!! ), mushrooms and onions and gave all that a quick sear too. You can use pearl onions if chopping onions make cry like it does me. Return the chicken back to the pan, nestling it among the potatoes. Scatter some whole garlic cloves and fresh herbs and then squeeze the juice of an entire lemon over the entire dish, even throw in the lemon rinds and pop it into a preheated 400º oven for about 20 to 25 minutes until the chicken is cooked through and you house smells divine. This takes about 15 minutes of active prep time and while dinner is finishing up in the oven you can throw together a quick salad and boom, dinner is done and it’s delicious too. Most of this meal came from things I had on hand. I had boneless skinless chicken breasts stocked from when they had been on sale. 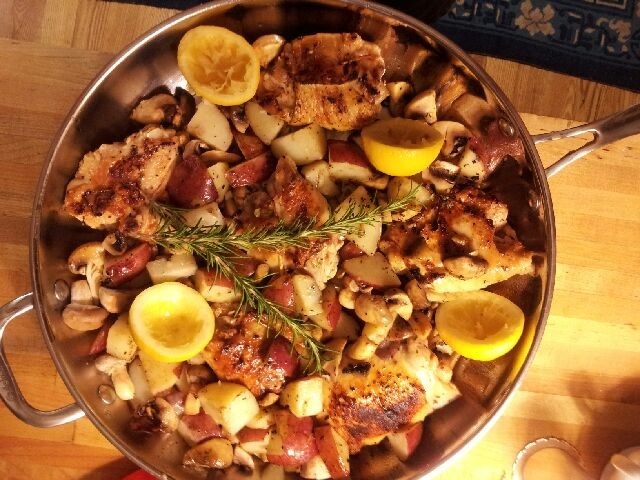 I also had lemons, potatoes, garlic cloves and mushrooms. The fresh herbs were from my garden. The salad was a spring mix I picked up at the grocery store along with a cucumber and grape tomatoes. You can use purchased salad dressing or you can make your own with oil and either vinegar or lemon juice. In our house we often have one dish meals. Of course this one had 2 with the salad but you could tuck some carrots or zucchinis into the chicken and have a real one dish meal if you like. There are no rules, just do what you like, with what you have on hand. Quite often I will make a large salad and then top it with something like chicken or salmon that I cooked on the grill. This is super quick and more filling than you may think. Also, with cooking the meat on the grill, there are barely any dishes! All of this is to say: It’s really not all that difficult or time consuming to put a great meal on the table in order for the opportunity to spend time together relating and conversing. It is the point you know; we were made for relationship and the more we intentionally make opportunities for relationships to happen, the more those relationships will grow. Honestly, meal times are the best times in my life. Taking the time to make sure the food is good and wholesome is a wonderful thing but it is a means to an end. I hope you get to spend some time around your table soon, conversing and creating and strengthening relationships. Ginny do you know what they used to call that? depression dinner. NO chicken they used hotdogs but it was otherwise the same. It was quick, fast and filling.